Art writing is a hybrid genre that is situated somewhere between word and image. The aim of this attempt at collaborative writing is to try to give shape to a public space using words. 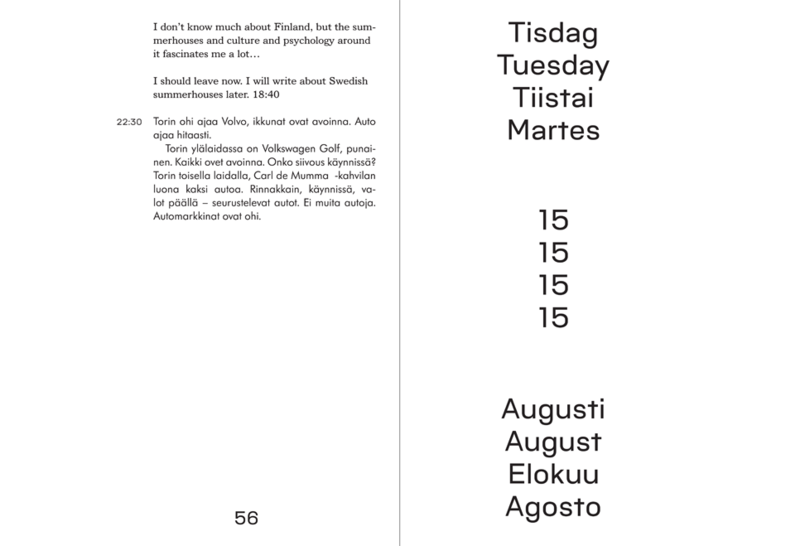 Nine artists were brought together in Ekenäs, Finland, for three days in August, 2017, to make notes while on the town square, the “Rådhustorget”. 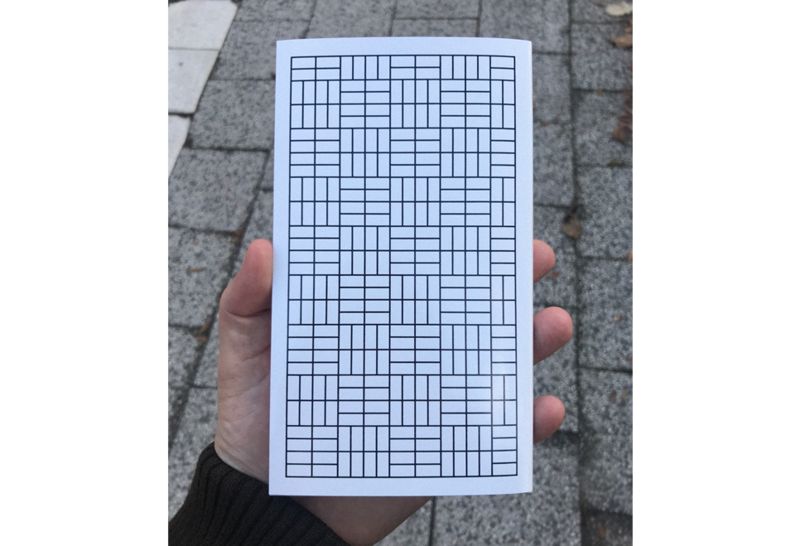 These notes have subsequently been compiled into a kind of index of the square, and Replay can be read as a sketch in words or a textual observation. Our notes are paralleled so that they follow a common time scale, instead of being presented one after the other. Time thus plays a pivotal role, and influences the shaping of the manuscripts into a book. The nine individual sets of notes are interwoven into a text so that events that played out at the same point in time are next to each other. I think one definition of parallel is never meeting. This strange existence is broken down in the book, with the simultaneously written notes reshaped by or even subordinated to time. 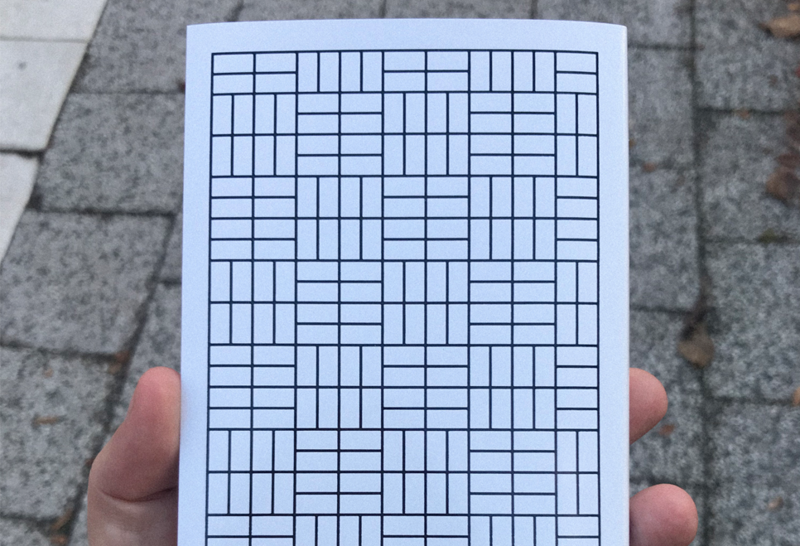 The question can be asked whether this really means that we have written a book together, and if the interlaced form is a mark of collaborative writing. The answer is: There was a mutuality at the time of writing. Replay shows how we perceived one and the same place with eighteen eyes paired together into nine different viewpoints. 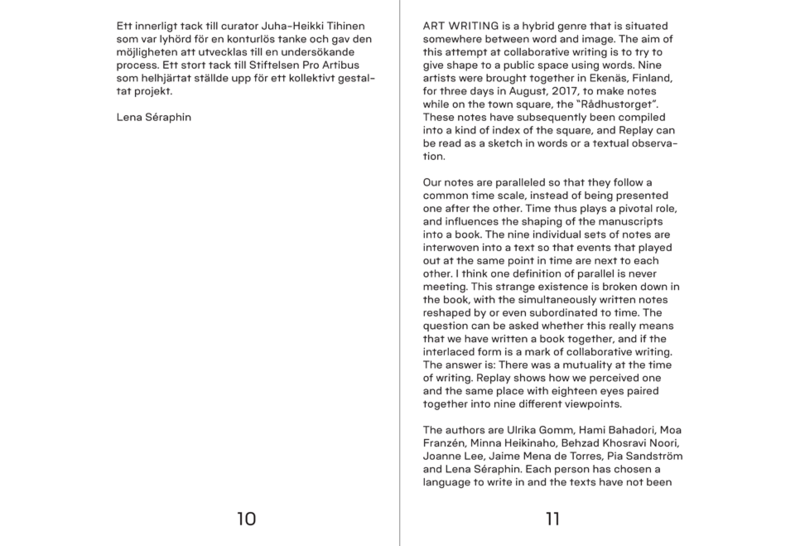 The authors are Ulrika Gomm, Hami Bahadori, Moa Franzén, Minna Heikinaho, Behzad Khosravi Noori, Joanne Lee, Jaime Mena de Torres, Pia Sandström and Lena Séraphin. Each person has chosen a language to write in and the texts have not been translated. The idea of eschewing translations has its basis in the very observation of the square. It is, in fact, impossible to grasp everything that is happening in a public space, which gives rise to a constant sense that something is imminent. In other words, the overall view is constantly lacking. A similar absence of an overall view is established through the multilingual nature of the publication – readers may well have to put up with their own linguistic limitations during the reading. Replay is a reflective text that is more about empathy and bearing witness than about making judgements. Writing on the Rådhustorget prompted questions as well as concerns, since, when we shed light on one thing, something else is cast into shadow. The square was a fragment that filled our field of vision, but it was equally a reminder of everything that does not happen there and, above all, of everyone who does not go across it. One question that the writing posed related to choice. 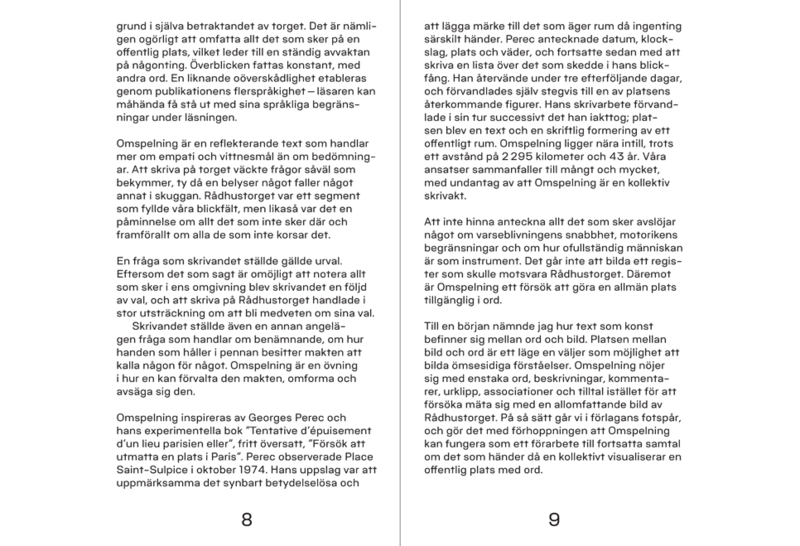 Since, as said before, it is impossible to write down everything that happens in one’s surroundings, the writing became a series of choices, and writing on the Rådhustorget was to a large extent a matter of learning to be aware of one’s choices. The writing also posed another crucial question about naming and labelling, and about the way that the hand that holds the pen possesses the power to call someone something. Replay is an exercise in how one can wield that power, transform it, and renounce it. Replay was inspired by Georges Perec and his experimental book Tentative d’épuisement d’un lieu parisien, or An Attempt at Exhausting a Place in Paris. Perec observed Place Saint-Sulpice in October 1974. His idea was to pay attention to the seemingly insignificant, and to notice what is taking place when nothing special is happening. Perec noted down the date, time of day, place and weather, and then went on to write a list of what was happening within his field of vision. He returned on three successive days, and was himself gradually transformed into one of the recurrent figures in the square. His writing work, in turn, successively altered what he was observing; the square became a text and a written rendition of a public space. It is not far from this to Replay, despite it being at a distance of 2295 kilometres and 43 years. Our approaches match to a large extent, with the exception that Replay is a collective act of writing. Not being quick enough to note down everything that is happening reveals something about the rapidity of perception, the limits of motor skills, and about how imperfect the human being is as an instrument. It is not possible to create a register that is equivalent to Rådhustorget in Ekenäs. On the contrary, Replay is an attempt to make a public place accessible in words. I began by mentioning how art writing exists between words and images. The space between image and word is a setting that one chooses as a possibility for constructing reciprocal understandings. Replay makes do with single words, descriptions, comments, excerpts, associations and forms of address, instead of employing an all-encompassing image of the Rådhustorget. We thus follow in the footsteps of our predecessor, and do so in the hopes that Replay can inspire continued conversation about what happens when a collective visualizes a public place using words. 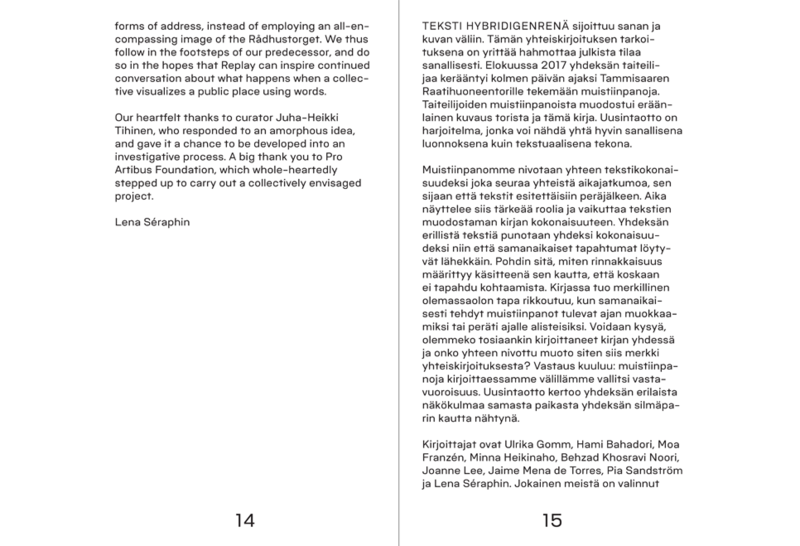 Our heartfelt thanks to curator Juha-Heikki Tihinen, who responded to an amorphous idea, and gave it a chance to be developed into an investigative process. A big thank you to Pro Artibus Foundation, which whole-heartedly stepped up to carry out a collectively envisaged project.